The Applied Learning & Career Center is giving away an iPad with their 2019 Career Prep Series! 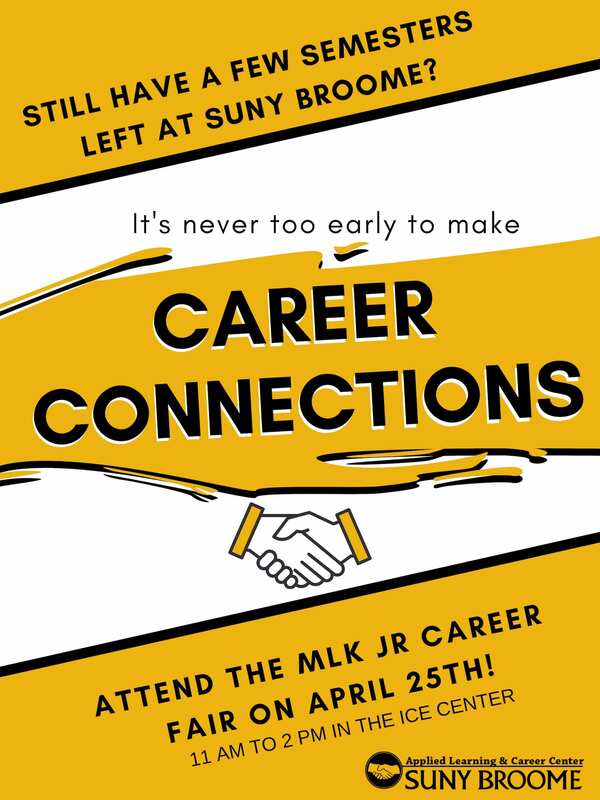 In partnership with the New York State Department of Labor, the 2019 SUNY Broome Martin Luther King Jr. Career Fair will be held on Thursday, April 25, 2019, from 11 a.m. to 2 p.m. in the SUNY Broome Ice Center. Miss the Convocation Day keynote address? For a limited time, watch it online. SUNY Broome Theater’s spring production will be The King Stag, written by Italian playwright Count Carlo Gozzi in 1762. The time of each performance is 7:30 p.m. in The Angelo Zuccolo Little Theatre on Tuesday, April 30; Wednesday, May 1; and Friday, May 3. Bring a friend and you can both earn entries to win an iPad! Our SUNY Broome community is bound together by our commitment to learning and academic community. The Council for Operational Issues will meet at 9 a.m. Thursday, April 11, 2019, in the Darwin R. Wales Center’s Gary Alan Bosket Conference Room (Wales 203B). It’s never too early to make career connections! The Council for Academic Issues will meet at 3 p.m. Wednesday, April 10, 2019, in the Darwin R. Wales Center’s Gary Alan Bosket Conference Room (Wales 203B). College Assembly will meet at 3 p.m. Monday, April 8, 2019, in the Darwin R. Wales Center’s Gary Alan Bosket Conference Room (Wales 203B).